Navjot Singh Siddhu is a ridiculous ridiculous man – and it can’t be said enough. In fact he’s so ridiculous that he could be worthy opponent for Rahul Gandhi as far as the “cause-of-embarrassment-to-own-party” award is concerned. Last year in BiggBoss, he openly acknowledged during a “sach ka saamna” styled task that he as a cricketer had accepted money to play badly. Basically, match-fixing and the whole 9-yard. Then BJP had to intervene to take him off the show before anybody notices, citing his “requirement” in Gujarat elections. Yeah right! It’ll be years before he would be successfully convinced that how ridiculous is his presence on national TV as a lame-laughter-machine – I mean the whole point of several of these laughter challenges is to tell a joke which will NOT make Siddhu laugh. While many prayers for his disappearance from national TV were never answered, Siddhu did manage to disappear from his constituency Amritsar after winning elections. Seems Kapil Sharma’s comedy has kept him busy in Mumbai. Modi hugging Muslims, Vijay Goel crying. Now since the nation is awakening towards keeping criminals out of politics – should there also be an ordinance to keep lame-azz comedians too? Rahul Gandhi, you listening? But why would you listen, an anti-comedien ordinance will hit you too – you have done your share of comedy in politics on several occasions. In fact, some tweeters only tweet to trend #pappu tags. Anyway, latest tale of ‘nautanki’ from Siddhu land is his attempts at correcting his image among his constituents by sitting on fast-unto-death. And his demands were, well, not very clear. You may remember some of his constituents has pasted posters of his disappearance across Amritsar stating “Siddhu Tum Kahan Kho Gaye” … and Siddhu pondered over it for several days and pulled out this “brilliant” trick of sitting on a fast to protest against absence of development in Amritsar. Your reaction should be “WHAAAAT? 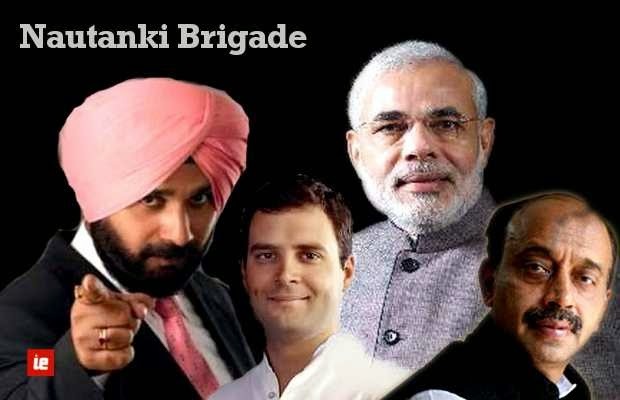 ?” – because Siddhu (from BJP) is in alliance with Prakash Singh Badal govt in Punjab. So, it’s like Sheila Dixit sitting on fast-unto-death to protest against power bills in Delhi. Or, Rahul Gandhi tears up an ordinance passed by his own govt calling it ‘ridiculous’ in a press conference – wait that really happened! That’s Rahul-pappu-aka-future-PM-Gandhi for you ladies and gentlemen. Lame nautanki is so prevalent in Indian politics that newspapers should dedicate entire page to highlight daily nautanki by our leaders. How they assume that public won’t be able to see-through it is beyond my grasp. Or, maybe a large percentage of Indian voter is still so gullible that it falls for this kinda crap, again and again. Else, why would you see characters like Raj Thackeray, Mayawati, Mulayam still becoming stronger? Current breed of politicians won’t leave any stone unturned to try sell their agenda to public, however lame. Else, why would they use a valid form of protest like “fasting” in such trivial pursuits? PS - Siddhu did call of his “sincere fast” after BJP president Rajnath Singh and Prakash Singh Badal together talked some sense into him. The whole issue was later termed internal matter. Personally, I feel for you Rajnath Singh; the kind of bufoonery you have to handle from all directions in BJP these days.